How planes takeoff? Why planes turn left on the runway? Do I need flaps for takeoff? That’s the trim? Today I answer these questions. I will skip fundamentals of flight for now (don’t worry – I will cover it soon) and move straight to takeoff. For more lessons visit “Flying lessons” archive. To takeoff, the plane must speed up to a speed sufficient to generate lift. This speed varies between aircraft types, and it depends on weight and configuration, like the flap settings and the use of other lift-generating devices (slats for example). For each aircraft, this speed is known and pilot checks it in the handbook or calculates it with a computer, which takes into account parameters like weight, flaps and pressure altitude. This value is the rotation speed – VR. You notice that important speeds are abbreviated with V (from “velocity”) and the designation, which often suggests the meaning (R for Rotation in this case). You can read about the V speeds in the text I once wrote. The airspeed indicator is important in this lesson too, so I recommend you also read my post on ASI. However, please reading this text first – I will repeat these links at the end if you want to know more. Cessna 172 rotates at 55 knots (VR 55 knots). If you chose a different plane – browse through its handbook and note the speed, you need to use. For example, Cessna 182 rotates between 50 and 60 knots, and Piper Comanche at 74 knots (85 miles per hour). Remember the VR speed of the plane fly. I wrote about the speed of rotation, but I should explain what’s the meaning of rotation. Rotation happens when the plane raises its front wheel. At a certain speed (to be exact – when crossing this speed – because the speed is increasing), pull the yoke or stick (joystick) towards you. The elevator will change position and the nose will lift the ground. Pull the yoke or joystick smoothly and firmly but not violently. You also have to be careful. Apply pull far enough for the nose to rise – you don’t want it to point to the sky. With the raised nose, the angle of attack increases and the lifting force is generated on the wing. The plane should climb. Before I say what’s next, I need to step back to an important element I omitted. Easy. Open the throttle and the plane rolls and takes off. Try this and you will ask “why is the plane turning on the runway”. Why it turns left like it was making some kind of political statement. Cessna does not have political views but has a propeller that rotates in a clockwise direction. In other aircraft (in the vast majority of planes in the world) propellers are also spinning clockwise. These cause several phenomena that add up resulting in the tendency to turn the plane to the left. You need to counteract this. Historic digression – on a new plane always check in which direction the propeller is spinning. In extreme cases, the reverse rotation of the propeller can kill (in the simulator there is no such danger). Late in the second world war, British Spitfires were re-engined to “counterclockwise” Griffons. At least several pilots had accidents due to a “wrong” direction of propeller rotations when they applied the usual right pedal to counteract it. To roll, release the brakes (press the dot to release the parking brake), and then open the throttle all the way with a single smooth motion. Airplanes such as the Cessna 172 always takeoff at full power (fully open throttle)! When the plane moves – correct the path with the front wheel and rudder. Both are assigned to the same pedal or joystick mechanism. With pedals – move the right pedal forward. Or rotate joystick to the right. Rudder deflection depends on the aircraft and speed. It can (will) change during the takeoff run. Correct the direction throughout the whole roll and try to keep the plane on the centerline. When passing VR, pull the yoke or joystick towards you. You have already read about the rotation, so you know what to. Then you start the climb. You have rotated. Plane’s nose raised. The plane is in a climb. Is the earth moving away? If so – everything is well. It’s time to look at the airspeed indicator and altimeter. You need to climb to 1000 feet above the airport at the optimal speed. First, check the airspeed indicator. Is the speed increasing? It should. Now let the plane speed up to Vy (another V-speed I mention today) – Vy for Cessna 172 is 79 knots. After reaching Vy, pull the yoke or joystick towards you to keep the speed of 79 knots (in Cessna 172). If the speed still increases – pull harder to steepen the climb. If the increase in speed has stopped before reaching Vy – reduce the climb angle by push forward (push – a compared to the position it’s in, you probably need not push it forward of the neutral position). At this stage, you control the speed with the climb angle only and the engine is still running at full power. After reaching 1000 feet above the airport, push the yoke/joystick to level the flight at the designated altitude. This part of the training ends here. Why Vy? Why shouldn’t you fly faster? Or slower? The initial climb after take-off is the most dangerous part of the flight, and engine failure in a single-engined plane results in difficult off-airport crash-landing or in an even more difficult u-turn towards the airport. At Vy plane climbs with the highest rate-of-climb. Therefore Vy will give you the biggest increase in flight altitude per unit of time. Height gained in this way can be a lifesaver in the event of failure as the plane will glide further. Flaps? What about the flaps? Set “small” flaps. In Cessna 172 – 10 degrees, which is the first position. Large airplanes almost always takeoff with flaps extended in takeoff position. In some – several positions are available and chosen depending on weight and conditions. In small aircraft, no flaps takeoffs are acceptable (maybe even frequent), but the decision not to use flaps should deliberate. Flaps help with takeoff in most cases. That is why, at this point, I advise “small” flaps for each takeoff. And when to raise the flaps? At this stage (of training), I suggest you do not touch the flaps until the end of climb at Vy. The trim tab is a small part of control surfaces, which can angle to balance the forces acting on the controls. Correct trimming stabilizes the flight. A simplification, but it is sufficient now. The elevator trim angle changes the position of the elevator when the aircraft is in motion. The wrong angle of the trim tab will make it difficult to maneuver, and in an extreme case, it may be catastrophic. 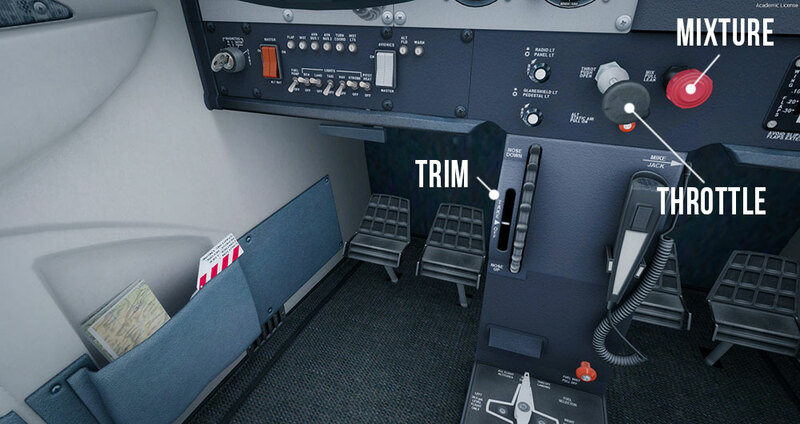 In flight, the correct trim by the feel of the controls – pilot eliminates any pressure on the yoke (I will explain this in detail in the next lesson). It is not possible to trim the aircraft that is not moving, therefore before the takeoff pilot should set the trim in the position recommended by the pilot’s handbook. In Cessna 172 this position is marked. Set the pointer to the marked position before takeoff. I will write more about trim in the next lesson. The plane took off by itself! This may happen during the roll. And it’s connected to trimming. At some weights, at the low weight, the plane may rotate and climb before reaching VR. Do not worry – this is perfectly ok. Takeoff position of the elevator trim is approximated and doesn’t take the actual weight into consideration (it does in computer-equipped airliners but not in Cessna 172). If the plane takes off by itself – let it. Just control what is happening and begin your climb as described above. I have already mentioned the need to control the speed, so look at airspeed indicator frequently. You should also reach the designated height – the second instrument to look at is the altimeter. Roll and takeoff put the heaviest load on the engine, therefore, you must also look at the engine indicators. Keep an eye for a sudden drop in oil pressure, an unusual rise in temperature or other undesirable phenomena. Maintain the direction by observing external reference points. Choose a point on the horizon and steer towards it. It’s a better than looking at the compass. For this exercise, I chose Heringsdorf, which has a nice and free scenery for P3D and FSX. There is a comfortable, long and wide runway – so I recommend it. You can practice this at any airport, but I suggest using one with wide, paved runway. Training on a narrow grass strip is much harder. Captain7, who generously shared his Heringsdorf for free also did a payware scenery of Magdeburg. Take a look – it’s really nice. Load the simulation, set the parking brake (Ctrl +. [Dot]) and auto-start the engine (Ctrl + E). On A2A plane, use the Shift-3 panel and auto-start option. If the engine was running – leave it as it is. Set the trim so that the indicator agrees with the arrow (default 1 and 7 on the numeric keypad). Make sure that the fuel mixture is set to rich (red lever in Cessna 172 pressed all the way into the panel). If it is not – use the mouse to push it forward in the virtual cockpit (click and drag). Close the throttle (move the lever on the joystick back / same with the throttle in the virtual cockpit). Open the throttle with a smooth motion (fully!). Use the rudder (pedals or joystick rotation) to control the direction. When passing VR, pull on the yoke or joystick. VR for Cessna 172 – 55 knots. Confirm the plane is in climb. Stabilize the speed on Vy. For Cessna 172 – 79 knots. Level of at 1,000 feet above the ground. If you in Heringsdorf – level off at 1100 above sea level (the runway is at about 100 feet). Repeat and practice. Good luck!